Carrying a surfboard on the trains through Tokyo sounds like nobody’s idea of fun, be them the surfer in question or the fellow passengers forced to make room where said room may not appear to be available. If you’re prepared to look like a bit of a plonker and can deflect the stink-eye stares from others though, getting surfer and surfboard from A to B on Tokyo’s trains is perfectly possible. First of all, let’s address some red tape -- train companies (JR, Shinkansen, Tokyo Metro et al) appear to have no objection to surfboards being carried onto their trains. However, they must be no longer that 200cm, and they need to be in a case. My surfboard-carrying experience on Tokyo’s trains has taken in the destinations of Narita Airport (for overseas surf trips, the last of which was to Bali), Haneda Airport (for domestic trips, the last of which was Miyazaki), and Hinode (for a boat to the Izu Shoto island of Niijima). Now, a serious qualifier here is that I live on the Tozai Line, mention of which will likely send a shudder down the suits of seasoned Tokyo commuters. The Tozai Line is notorious for being the most crowded of Tokyo’s trains and one that is liable to be delayed by nothing more that a mild gust of wind. The point being then, that if you and your surfboard can come out of a Tozai Line journey unscathed, well, anything is possible. Of course, this is going to depend on where you’re starting from. I live in Urayasu, just across the border from Tokyo in Chiba. Given that Narita Airport is stuck in the back-end of nowhere, a long way from Tokyo, what the surfer will have to suffer in terms of distance in getting from Tokyo to Narita Airport, is likely to be made up in terms of ease of getting on, and finding space on, the trains, especially if you are starting from the Chiba side of Tokyo, as I do. Basically, most people are going in the other direction. 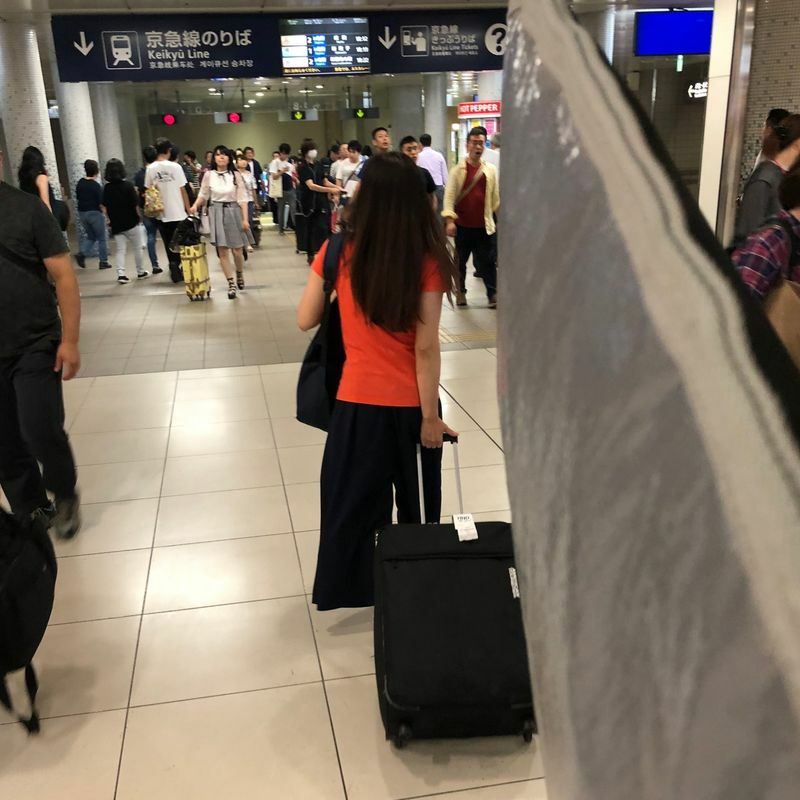 Transporting your board from Tokyo to Narita Airport comes with the benefit of it being clear to other passengers why you have such luggage and where you are headed, because there’s little else out there in the surrounds of Narita. And you’ll be able to take comfort in the presence of fellow luggage-bearing train travelers. It’s relatively easy on the return from Narita to my home. Of course, boarding at Narita means being among the first to get on the train, and again, you’re not the only one carrying absurd amounts of luggage. Getting to Haneda Airport, on the other hand, will likely mean passing through some prime bits of Tokyo real estate and some of the busier of the Japan capital’s train stations. This is proper “commuter” territory, and many of those people heading to the airport will be doing so for work rather than pleasure. Image how they feel about bumping into you as you head out on your jollies … with a surfboard pressed against their briefcase?! 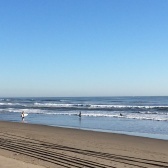 In most cases then, Narita is going to present the easier airport choice for those heading out on a surf trip. In fact, Narita Airport could also be an option for domestic trips as it serves as the hub for most of the budget airlines operating in Japan. 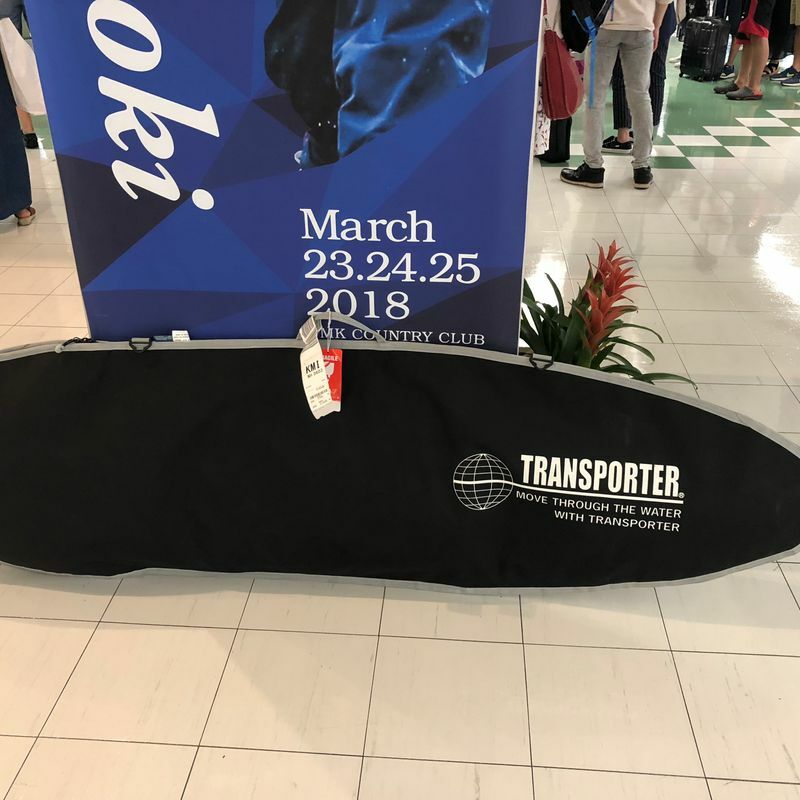 That said, budget airlines (or LCCs) will have more restrictions on the size of a surfboard that can be carried when compared to flag carriers like JAL and ANA. Really, it’s a case of the earlier the better (or, the later the better) when it comes to riding Tokyo’s trains with your surfboard. Being on the Tozai Line this is especially true. Emphatically then, get on the train as early as possible, even if it means extra hours of waiting at the airport. 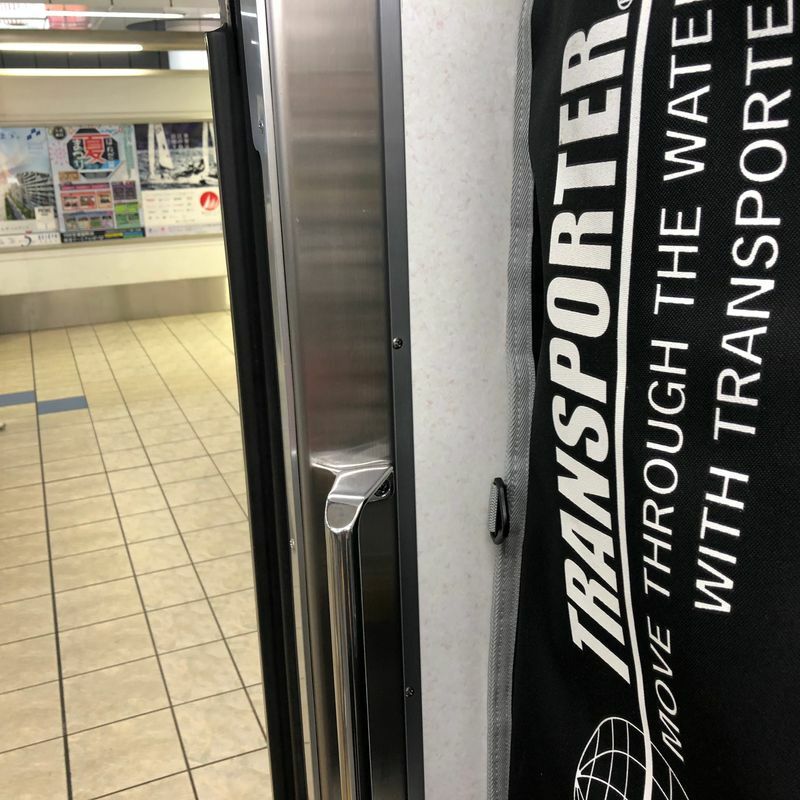 In fact, such is the challenge presented by traveling on Tokyo’s trains with a surfboard, it becomes a serious factor to consider when choosing the time of a flight. This is just good sense really. It means you can prop your board up against the driver’s cabin and you’ll be presenting other passengers with less of an obstruction. In fact, last / first carriage or not, if you can’t get your surfboard propped up against the end of a row of seating, you’re in a spot of bother because it will likely mean having to move it about as people try to get on / off the train. Propped up against the end of the seats and you can stay put! It’s also worth noting that I’ve never tried to lay my board down on the luggage racks above the seats. I’m not sure it would even fit, but if it did, it would be a massive obstruction to other passengers. While I’ve never taken a surfboard on the Shinkansen (which you are perfectly free to do) I did once see a large party of foreign skiers / snowboarders bring all their gear onto a Shinkansen from Tokyo to Nagano. It looked like they were two families on holiday together. Anyway, they managed to get all their stuff onto the luggage racks above the seats but there was so much of it (skies, snowboards et al) that it took up about half of the rack for that side of the train carriage. Fortunately, the Shinkansen was half empty so it didn’t prevent other passengers from stowing away their luggage. I guess the message here is that it can be done, if the train is half empty, or you don’t give a toss about others. Unless you’re on a very short, short board, it’s unlikely that you’ll be able to get your board off the train in a vertical position. You’ll need to go horizontal with it. You can’t do this without hitting fellow passengers unless you wait for them to get off the train before you. The problem with this method is that you’ll likely bump into those passengers that are trying to get on the train earlier doors in the hopes of getting seat. Still, nobody likes these people so bump away, I say! With a surfboard and accompanying luggage you’re enough of an obstruction to fellow Tokyo train travelers as it is. Try to minimize the damage then by having your tickets or passes ready before you go through the gates. This should be a given anyway, but with board and luggage to deal with, it will be hard to just casually reach into your pocket to get such things prepped. You usually have to pull over to do so. I’m the kind of person that wishes I could be invisible most of the time. I hate having to inflict myself on others. Not out of any sense of altruism, I’m just hopelessly insecure in the presence of other people. 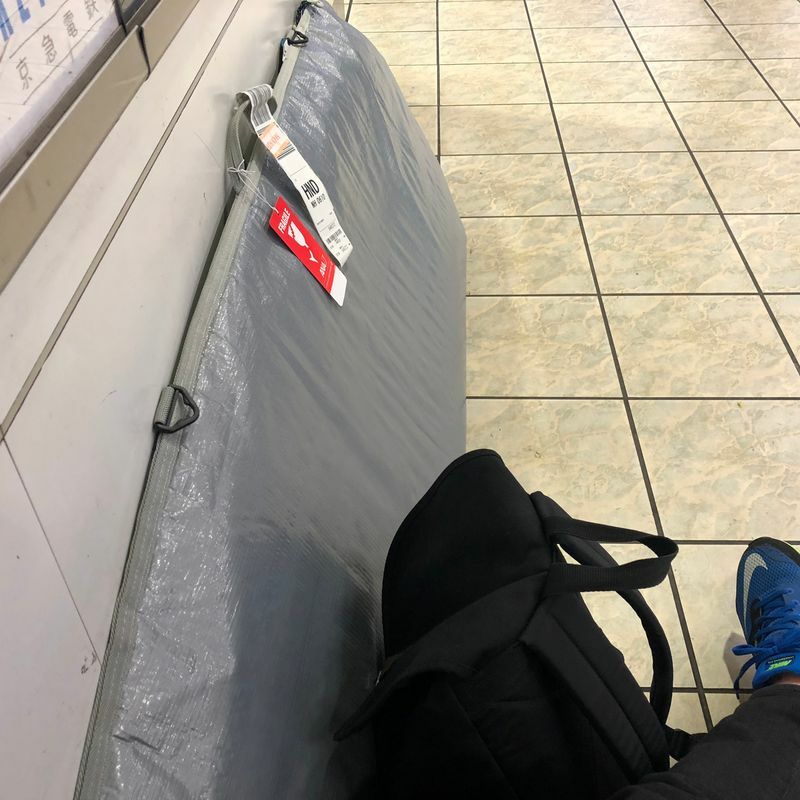 So it is then that carrying a surfboard on the busy trains of Tokyo weighs on my mind and is the biggest of any hassles that might be considered standard fixtures for a surf trip. Others might not care. If you’re like me though, you’re just going to have to accept the fact that there is only so much you can do to be polite and not get in the way of other passengers. Someone, at some point of the journey, is going to silently will you and your surfboard off the train. Just take comfort in the fact that you are not doing anything wrong.